Kalibak faces what he believes to be an easily defeated Superman. He is perplexed when he sees that Superman has changed considerably from the hero he thought he knew. Superman attacks Kalibak, punching him through the wing of a passenger plane, but Wonder Woman comes to the aid of the aircraft, which allows Superman to continue his attack on Kalibak. All over the world, parademons from Apokolips are attacking major cities. The Justice League teleports down to Earth to repel the attack, and Batman's group moves to do the same, but Black Canary imparts wise words to Batman, letting him know that to truly win, they need Superman on their side. Superman tells Kalibak to call off the attack, but Kalibak refuses, stating that Superman's pathetic moral code with be the doom of the Earth, and that there is no reason to fear Superman. Kalibak summons parademons to his side, mocking Superman for his morality. All over the world, Superman can hear people dying and he finally says: "Not Again." Superman unleashes a blast of heat vision that incinerates the parademons, while Kalibak is floored by the Man of Steel's efforts. Story - 2: I've tried to keep a moratorium on even mentioning Man of Steel, the new Superman film, in conjunction with any reviews I might do. This issue makes that extremely hard. The scene that Superman is put in looks very convincing. Kalibak is the devil on his shoulder, goading and daring him not to succumb to killing, because, obviously, that is the only answer. The pathos of hearing people screaming for help, the overwhelming nature of the situation, it's an orotund trap for the Man of Steel... until you remember that he's been in this situation before. Superman has dealt with alien invaders, Apokolips, even Darkseid and never had to kill before. What is different about this time, is that Taylor wants him to kill. He needs Superman to kill again. There is no story without this moment, this battlefield of Gethsemane moment. If Superman doesn't kill, then his actions with the Joker were hideous, petty, and immoral. If he does, he solidifies that sometimes "you do what you gotta do," to quote David Goyer. While it's clear that Kalibak has been beaten, it seems that Superman cannot defeat Kalibak's horde without killing them. There is no Silver Age solution, no Bronze Age remedy for this post-Modern comic book. There can only be one solution, one final way to solve the problem of evil, and it is death. The man who has been super because of his morality, who has possessed absolute power, but without absolute corruption, gives way to killing because the villain tells him that no one fears him. Comics haven't been for children in the USA for some time, and this book is a perfect reason why. There's no one in their right mind who would introduce this type of material to a child. However, the people who keep the comic market alive, the big kids like myself who remain open to the wonder that comic books and their superheroes present have to ask why is this happening. We were little and we wanted to be Superman, and while we realized with some attitude that we could never have his powers, we could al ways have his example. We would fall short, way short of the mark, but Superman would remain there, a great primary-colored friend ready to smile for us on the day when we got it right. 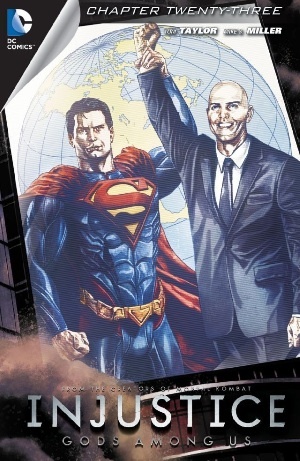 Who is this man in Injustice: Gods Among Us? Earlier it was easy to say that he wasn't our Superman, but after Man of Steel, that is not so easily spoken. Is he the Superman that we know re-imagined for a modern audience (we've heard that ad nauseam), or has this been the Man of Steel all along, the same as the rest of the bunch, only in reverse. Batman becomes dark after a severe childhood trauma, but Superman became a hero because it was the right thing to do. However, with sufficient trauma, he becomes the same as the rest of the lot; someone looking for a release for their distress, rather than someone looking to do good. Perhaps, somewhere, there is a Kalibak of sorts, whispering like faithful Iago to an editor, a writer, a suit, and he says: "They won't like him if they don't fear him." He was the same person, the bully who snatched away the comic and crumpled it, saying Superman was stupid and what are you going to do about it. You turned the other cheek because you didn't dare fight... and you had another copy at home. You got older and you learned how to fight the bullies, and you learned you could do it with having to be like them. You could be tough as them, but you didn't have to be them. Now it seems that the bullies have control again, they have the comic again, but they want more this time. They want to take the great example of Superman and tell you, "See! Even Superman got with it!" They may just be right. Cover Art - 4: Still nice... which one is the good guy again?